I recently got a Super MB Star C3 from OBD2eShop for my Mercedes 2009. 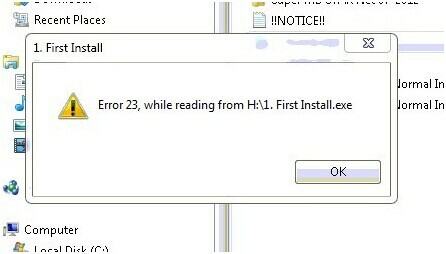 I got the MB STAR C3 device two days ago, tried installing it on the same day, but got an error message, reading “Error 23, while reading from H:\1.First Install.exe”, as shown below, during the installation. At frist, I installed the Mercedes STAR C3 diagnostic tool on a Windows XP computer, then I tried on another computer with windows 7 system, but the windows kept popping out. Please help me fix it, thanks. The error is probably caused by your system, which may not compatible with the tool. It is required that Super MB Star C3 should run in computer environment with professional Microsoft Window XP or Windows 7 system.